Two 10 Counts! in two consecutive weeks? 100 views, here I come. 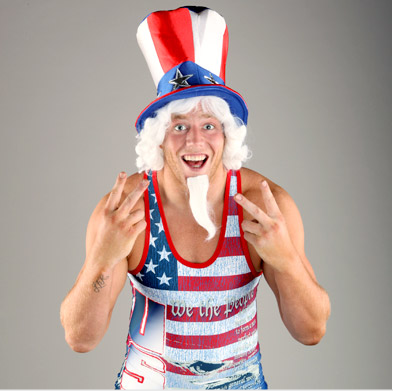 Rather than honoring our Independence Day by taking out aliens and dragging their dead carcasses across the desert taking a look at some of the most patriotic moments or wrestlers in the history of wrestling, let’s take a real close look at the clothes they wore while wrestling in the name of the U-S-A. A patriotic close look. The most American team ever this side of Team Angle, was the team of Lex Luger, Tatanka, and the Steiner Brothers. They were heading into the 1993 Survivor Series to do battle with the Foreign Fanatics (Yokozuna, Crush, Ludvig Borga, and Jacques). At one point, the WWE decided to write out Tatanka because a Native American at a Thanksgiving-themed pay-per-view was not American enough. Or maybe he was really injured. Point is, the All-Americans needed a replacement. Enter the dead man from Death Valley, CA. 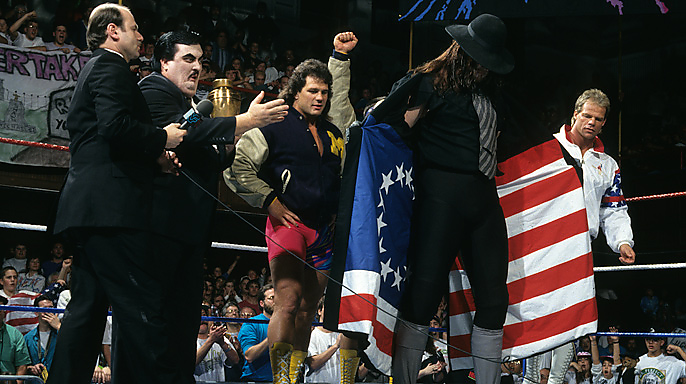 Undertaker proved his allegiance by unveiling the inside of his trench coat: a version of the original United States flag from 1777. Which meant The Undertaker had been dead for the last 216 years. Sometime in early 1993, Hacksaw Jim Duggan felt his All-American schtick was getting stale and was in need of a makeover. 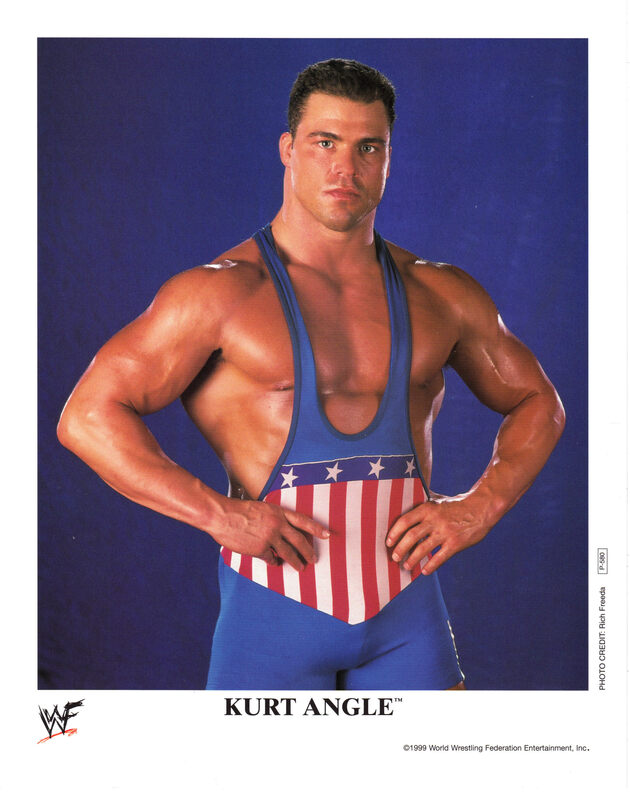 Instead of dropping the 2×4 and U.S. flag altogether, he decided to turn it up to 11 and adopt some new wrestling gear: a very basic blue wrestling singlet with some red and white stripes in the back, and matching knee pads. At least he switched up the color scheme. If anything, it helped in clarifying what his gimmick was since the waving of the American flag and U-S-A chants were too subtle. 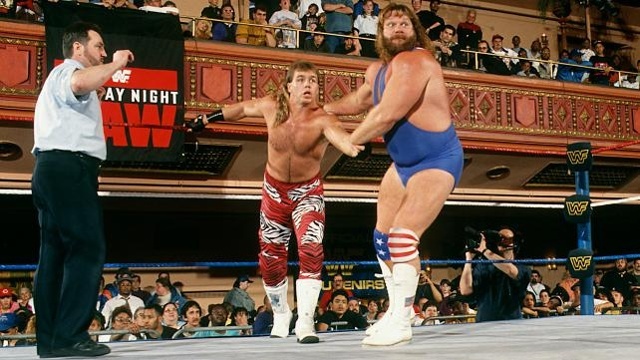 The All-American brothers decided to get into the spirit of things for their Survivor Series match and incorporate the stars and stripes into their own ring gear. Not a whole lot of creativity here as we would later see with other All-American singlets, but the message was loud and clear. The only problem were the boots. I get that they wanted to pay homage to their alma mater, The University of Michigan, but the theme wasn’t amateur wrestling college championships finals, or whatever. It was U-S-A. You’re telling me Rick Steiner couldn’t have at least bothered to wear two mismatching boots that just happened to be red and blue? 7. 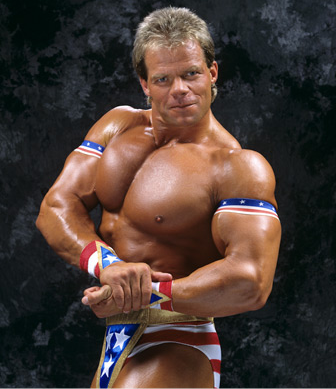 Lex Luger, Made in the U.S.A.
1993 might be the most patriotic year in the WWE, or in wrestling period. Which is weird, when you consider there wasn’t any U.S. military involvement in a major war, but there was the first attack on the World Trade Center. Maybe that had something to do with it? It could also be that one of the most tired wrestling tropes of all time is the “U.S. vs. them” storyline that’s been going on since the World Wars became a thing. In any event, The WWE had Yokozuna, a Samoan turned Japanese sumo wrestler, as its world champion. And with the departure of Hulk Hogan, and Bret Hart automatically being disqualified for being Canadian, the WWE needed an American hero. And Lex Luger just happened to be in the right place at the right time. Another tried and true wrestling cliche. Whenever a wrestler loses some “Loser Leaves Town/Company” match or is “fired,” a masked wrestler, who bears a striking resemblance to the recently future-endeavored wrestler, appears out of nowhere. I’m not going to lie, I enjoy this type of storyline as corny as it is. It’s probably because I really like wrestling masks. Some try to convince their opponents that they’re not who they think they are, like when Brian Pillman was the Yellow Dog. But others, like in the case of Hulk Hogan, just don’t give a damn. Mr. America was perfect because it was borderline meta. Hogan knew we knew the schtick, and did very little to change anything about himself except for his clothes. The entrance music was the same, the moves were the same, and the catchphrases were the same. Hell, the mask was made so that his mustache and hair coulld show. If anything, this was the alter ego hiding inside Terry Bollea all along. Not the subtle Hulk Hogan, but the over-the-top Mr. America. Rey Mysterio is the Jessica Nigri of WrestleManias. He loves to cosplay. It all started at WrestleMania XIX, when he came out as Daredevil. Although, to be fair, he had done the cosplay thing in WCW a couple of times as well. 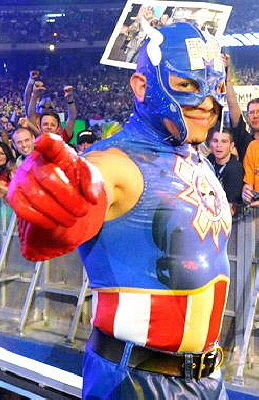 For WrestleMania XXVII, he went as Captain Mexican-American. The sad part was he wasn’t facing anyone foreign, the cool part was he was giving the anticipated summer blockbuster, Captain America: The First Avenger, some high-profile publicity, which it obviously needed. The reason why there is is no Jack Swagger, Charlie Haas or Shelton Benjamin on this list. They all were basically biting Angle’s style anyway and, in Swagger’s case, his moves. Hacksaw Jim Duggan paved the way for U.S.-themed wrestling singlets, but Kurt Angle and whoever designed his gear (perhaps a descendant of Betsy Ross) turned it into an art form. Year by year, the singlets evolved and went from hokey-looking variations of the American flag, to something that should be the official wrestling attire of the entire American Olympic wrestling team. 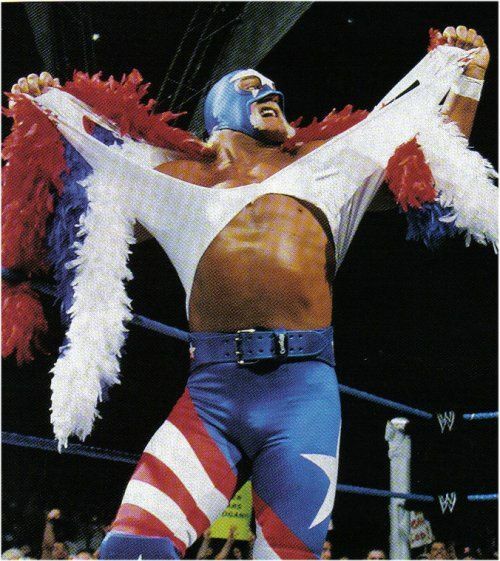 Before going on to finally defeat Ric Flair for his first and only NWA World Title, The Stinger debuted his red, white, and blue costume. 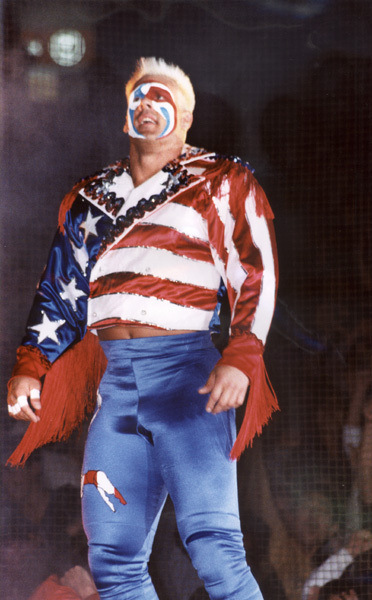 While Sting’s choice in attire was an homage to our nation at the most American-themed pay-per-view, he was wrestling someone from Charlotte, North Carolina, not Japan, or the Middle East, or some European country. This attire probably would’ve seemed more appropriate had he worn it at the previous Great American Bash, where he wrestled The Great Muta. But that was for the television title, and if you think Sting was going to go full patriot for the damn TV title, then you don’t know Sting. Aside from crow Sting descending from the rafters, or beating Hollywood Hogan in that botched finish at Starrcade, this is easily the defining moment of Sting’s career. He beat one of the greatest wrestlers of all time, won the world title, then was hoisted up on the shoulders of his peers, in all his old glory glory. It’s the moment Lex Luger wished he was given at WrestleMania X. The most Hulk Hogan ever did in his feud against Sgt. Slaughter was defend America’s honor, beat him for the WWE World Title, and wore a blue bandana with white stars at WrestleMania VII. He didn’t even bother to go old-school “American Made” Hulk Hogan. How are you going to fight an evil foreigner, or in this case an Iraqi sympathizer, and not switch up your wrestling gear to accurately reflect your home country? 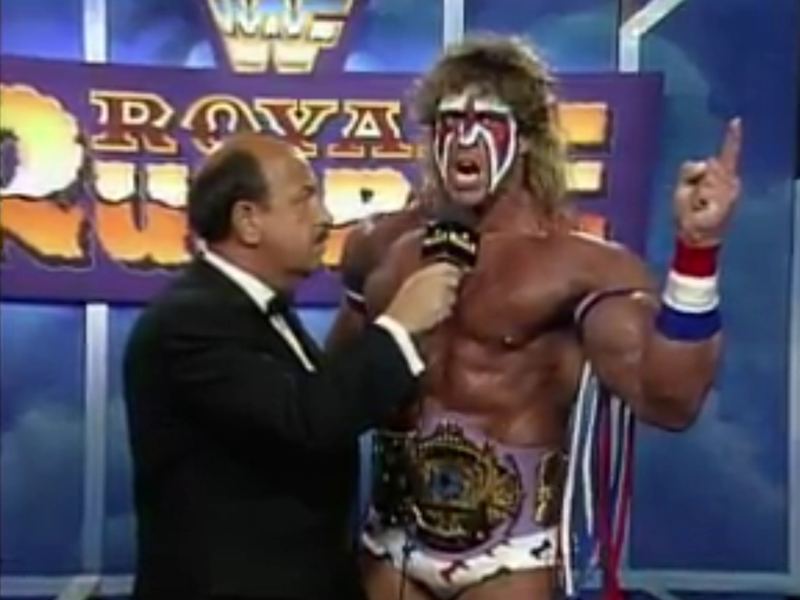 At the Royal Rumble 1991, not only did The Ultimate Warrior defend America’s honor, by incorporating the red, white, and blue color scheme all over his body, but this dude wasn’t even American! He was from Parts Unknown! Who knows where that is? This is one of the more memorable outfits ever worn by the Ultimate Warrior, and easily the #2 attire behind his WrestleMania VI attire in every damn WWE video game Create-A-Wrestler version of The Ultimate Warrior. I was a fan of The Patriot from his GWF days. 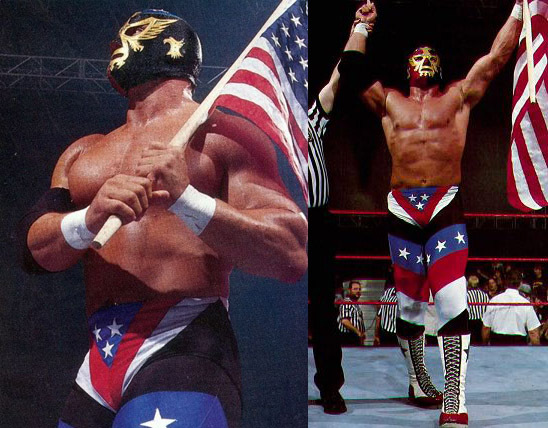 Not because I was a patriotic kid, but because The Patriot was a masked wrestler. And as I mentioned before, I really like wrestling masks. He was an American luchador. And back in the early 90’s, we didn’t have a whole lot of luchadores working in American pro wrestling. At least not in the WWE, or in WCW. And wrestling masks are cool, dammit. His mask even looked like Dos Caras’ mask. Only with one eagle, instead of two, because U.S.A. is number one. In terms of American patriotism, this guy was head and shoulders above the rest. The Patriot even made Jim Duggan look like Nikolai Volkoff. And a very big part of that had to do with his star-spangled gear.